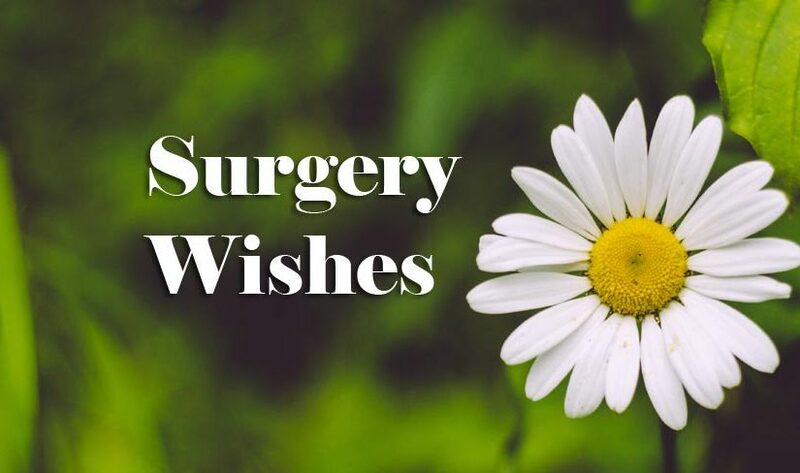 Surgery Wishes Messages : No one likes the feeling of going under doctor’s knives and scissors. But every now and then people have to experience this scary event called surgery. Surgeries are very common in our life yet we are so much afraid of it. When a person is scheduled to go under a surgery, he is afraid, nervous and needs some really strong emotional supports from his nearest and dearest ones. If someone close to you is having a surgery, you really need to wish him some inspirational words or with some funny words to keep him stress free in this situation. Your words mean a lot to people who are undergoing a surgery. Check these good wishes for surgery. There is no reason of fear, because God is always with you. You will be fine. We all are waiting for seeing you soon as a healthy, strong and handsome guy! Wish you all the best! Dear friend, in my life you are the one who stayed with me all my difficult situation and I’m also the one who stayed beside you in every difficult time. I hope you can quickly recover your surgery. Stay strong! It is very true that every person feels some fear because of surgery. But you are the strongest and that’s why you have taken the right decision. The surgery was very necessary for your health. I am sending you all the love & good wishes! Dear, don’t lose hope. Just think that the surgery is for the sake of you and your health. Stay strong and go ahead. Wishes for your positive result! What are you thinking right now?? A bunch of viruses are stronger than you? No Dear! You are the one who can stay strong whatever happens. So don’t worry & just go through this procedure! Stay strong! Dear, just think that surgery is a very simple thing. 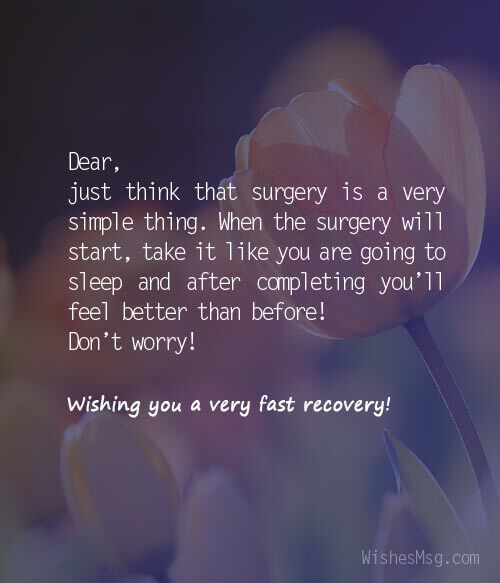 When the surgery will start, take it like you are going to sleep and after completing you’ll feel better than before! Don’t worry! 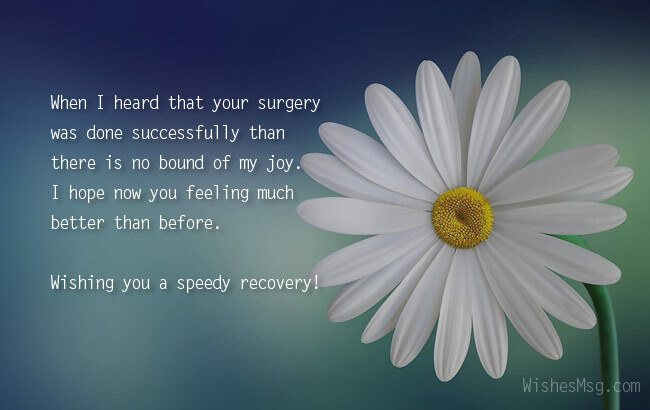 Wishing you a very fast recovery! I think surgery is a painful thing and you also think that. But keep one thing in your mind that after completing the surgery you will feel much better than before and it is good for your health. Take care of yourself! Enter into the surgery room is like an adventure Dear. You may be senseless the whole time and I’m sure that you’ll complete your journey safely. Don’t be afraid Dear! Wish you all the best! Don’t worry! You are in the hand of best professionals. So, there is nothing to be worried. You’ll see that you will recover soon and we all are visiting you there. Good luck! Look at the future with positivity. It’s time to leave the negativity from your body. The doctors will do whatever is necessary for your body. Keep in mind that all is well. Best wishes for your surgery! Dear, I’m sending you all the positive energy all over the world! During this time I can’t stay beside you but believe me my love is always there! I’ll there as soon as possible. Take my love and stay strong! I have always admired you for your courage and positivity. I become very glad to know that during your surgery you stayed strong there. Keep in mind that your positivity will cover your health half. Get well soon dear! Dear, I’m praying all the time during your surgery and now it’s complete. So now time to come back home. Wishes for your fast recovery! When I heard that your surgery was done successfully than there is no bound of my joy. I hope now you feeling much better than before. Wishing you a speedy recovery! This message is for just wanted to let you know that how caring we all are about you. We all are sending you wishes for your fast recovery and good health. Don’t lose hope. We all are stay beside you. Get well soon dear! Dear, your absence had created a vacuum in our group. We miss you a lot. It’s great that your surgery had done and after some days you may join with us as before. Our group will get its life back! Wishing for your fast recovery! I’m praying to Allah for your very fast recovery than anything else. I hope Allah will understand my feeling! My best wishes for your fast and full recovery! Wishing that every day will bring your happiness, brighter time, healthier and happier you. Get well soon dear! It’s good to hear that you are out of danger now. Now, try to stay positive through your recovery. Wish you all the best! I knew that how brave and strong you are! And you again prove it during surgery dear! Now waiting for your fast recovery. Get well soon! Do you know how special you are to me? I miss you all the time. During your surgery I can’t stay there but my soul was there always. Now you are out of surgery room and we’ll meet as soon as possible. Wishes for your fast recovery! Dear, how are you feeling right now? I hope you are feeling better than before. Wishes for a healthy and happier you!